If you have suffered from a neck problem for three months or more, your pain will be described as “chronic”. The pain may be severe or mild, constant or intermittent; these factors will determine the degree to which it affects your life. Precise causes of chronic neck pain are often difficult to determine. In more than 50 per cent of sufferers, it stems from the facet joints as a result of osteoarthritis, spondylosis, or a previous trauma such as a whiplash injury. If you have nerve-root pain, the most probable cause is a prolapsed disc. Less common causes of chronic neck pain include myofascial pain and, very rarely, cancer. The symptoms of chronic neck pain are similar to those of acute neck. Older people with degenerative changes in their neck may experience grinding or grating when moving, causing stiffness and aching. Recurrent episodes of more disabling pain can be triggered by trivial movements such as rotating your neck suddenly, jolting or jarring, and extending your neck or bending forwards for sustained periods of time. 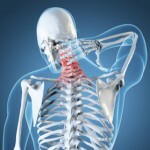 Numbness, pins and needles, and weakness in your hands may be a sign of cervical myelopathy – when the spinal cord in the neck is squeezed by degenerative changes in the bones and discs, leading to impairment of the nerves, affecting the arms and sometimes the legs – or spinal cord compression. Advanced cervical myelopathy may affect walking and gait. Chronic nerve-root pain may cause neuropathic features – when a nerve or nerves are damaged over a long period, leading to abnormal processing of pain – such as burning sensations. Mood and sleep patterns may become disturbed; the impact of the pain on your life can cause frustration and sometimes depression. The physical risks of chronic neck pain are associated with the more serious conditions of major disc prolapse or cervical myelopathy leading to spinal cord compression. In rheumatoid disease, the neck can become unstable due to ligament damage. Other significant complications of chronic pain relate to its effect on your life, work, relationships, mood, and fitness. perform MRI and injections to the neck. use medication wisely and appropriately. consider giving you a low dose of an antidepressant to relax your muscles and improve sleep quality. identify trigger points. If these are found, he may use trigger-point injections. suggest a functional rehabilitation programme. offer further treatment, such as prolotherapy. a functional rehabilitation programme to improve the range of motion. Call +65 64712674 for an appointment to treat Chronic Neck and Nerve Root Pain today. Same day appointment. The thought of serious neck injury is terrifying – and rightly so. A break (fracture) or dislocation in the cervical region of the spine can be potentially fatal or catastrophically disabling. Thankfully, though, few neck injuries are life-threatening. Learning that somebody has broken or dislocated their neck is always shocking news. Fractures an dislocations usually happen in accidents, typically in an automobile crash or as a result of sports mishap. Any injury in which this type of damage is even a remote possibility should be treated as an emergency and immediate medical help should be called. On no account should the person be moved unless there is imminent, and potentially fatal threat from another source. What Happens in Neck Fracture and Dislocation? A fracture means a break in the bone, while dislocation involves displacement of the vertebrae out of their normal position. The effects can be similar. Injury to the spinal cord can cause paralysis or death. Damage to the spinal cord in the neck can lead t paralysis. What Should be Done for Neck Fracture and Dislocation? In all cases of serious trauma to the neck, the body is immobilised until X-rays have been taken and the person has been assessed by a doctor. Treatment depends on which of the seven cervical vertebrae are damaged and in what way. For a minor compression fracture, a cervical brace worn for a couple of months may be adequate. A more complex or extensive fracture may need traction and surgery to stabilise the damaged area, which may entail months in a rigid cast, or a mix of these treatments. If you’ve played contact sports and suffered a burner or a stinger, you remember it. The pain shoots from the shoulder to the hand “like an electric shock or lightning bolt down the arm”. A burner or stinger is an injury to the nerve supply to the upper arm, either at the neck or shoulder, often following a fall onto the head – for example, following a tackle in football. When the head is forced sideways and downward, it bends the neck and pinches the surrounding nerves. As a result, you may feel numbness or weakness in the arm and possibly a feeling of warmth. Usually the symptoms subside quickly – within seconds or minutes – but in up to 10 percent of cases, the unpleasant sensations can last hours, days, or longer. You should immediately get checked by a doctor. An examination will confirm the type of injury. If the symptoms pass, you will probably need no treatment. But you may need further medical attention if you experience weakness lasting more than a few days, neck pain, symptoms in both arms, or if you have a history of recurrent stingers or burners. Having a narrow spinal canal – spinal stenosis – may make you more prone to burners and stingers. When your head is jerked violently and unexpectedly backward or forward – typically in a car accident or during contact sports – the resulting injury is known as whiplash. It can also be called cervical sprain (or strain) or hyperextension injury. The pain is caused by the soft tissues (muscles, tendons, and ligaments) of the neck being forced to the very limit of their range of motion. If the ligaments are torn, there will be internal bleeding bleeding between them and the vertebrae. You may start to feel pain and experience stiffness in the neck within minutes or it make take several hours for symptoms to be felt. 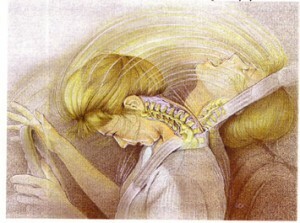 Further symptoms that result from whiplash may include neck spasms, dizziness, and headache. It’s important to seek medical help as soon as possible. Modern surgical treatment with internal fixation (screws, plates, rods) has eliminated the need for cast treatment in all but the most unusual circumstances. A plastic collar may be used for a short period. Subject to your doctor’s advice, anti-inflammatories and physiotherapy may help relieve discomfort in the early stages the recovery process. You can expect a full recovery within a couple of weeks, although some people have problems for longer. Research suggests that the sooner the symptoms appear after the injury, the longer they are likely to last. It also suggests that the average recovery time for a whiplash injury without any other associated symptoms is 32 days. In a study of 2,627 participants, one in eight had not recovered six months later. Call +65 64712674 for an appointment to treat Neck Injuries today. Same day appointment.